At Family Hearing Aid Center, our commitment to patient care was built around comprehensive science, patient empathy, and human trust. We do far more than offer hearing aid treatments. When you visit one of our hearing aid centers, we will help you with a comprehensive Oahu, HI, hearing loss rehabilitation program. Our commitment to each patient begins before you ever step foot in our office. To provide education to our patients on our process and treatment options, we will send you an information packet, along with Dr. Darrow’s best selling ‘Stop Living In Isolation’ book and accompanying audio CD. In this book, Dr. Darrow will answer two-dozen of the most popular questions he has received from his patients over the past 20 years. Everything from ‘how are hearing loss and Dementia are connected?’, to ‘what are the different treatment options?’, to ‘how affordable are hearing loss treatment options? Performed by our board-certified hearing aid specialists, our consultation is a comprehensive diagnostic procedure intended to define the degree of hearing loss and examine the impact of hearing loss on understanding words and conversation in both quiet and background noise environments. The best treatment begins with the best evaluation, and we use Dr. Darrow-approved evaluation skills to provide the best treatment in restoring clarity. Neurotechnology™ stimulates the auditory system depending on several factors, including the extent of impairment and the delay in treating hearing loss (e.g. how long have you been living with the untreated hearing loss). Treatment begins at the initial appointment and over the first few weeks and months, there is an adaptive process occurring as the patient’s brain becomes adapted to restored clarity. In an ideal world, we would begin treatment for each patient on the first day their hearing loss started. However, in the real world, statistics tell us that patients tend to wait an average of 7 years before starting treatment. 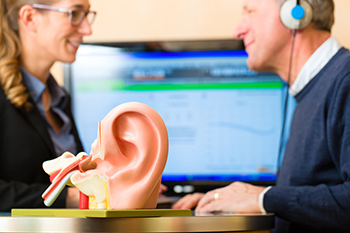 Our comprehensive auditory and Oahu, HI, hearing loss rehabilitation program will help you think faster, focus better, and remember more of what you hear. Your hearing needs continue to change throughout life and so we value our ongoing relationship with patients and commit to working with each patient for many years to come. Our comprehensive treatment program includes service, cleanings, supplies, annual hearing assessments, and ongoing support, depending on the level of treatment plan you choose. When you work with our practice you have a partner in enhanced hearing and improved quality of life – we will always look forward to seeing you whenever you need our help! Just like any great partner, we look forward to helping you and your family for generations. From hearing protection and preservation, to hearing aids and follow-up hearing care, to education and outreach programs, we are your full-service hearing aid centers in Hawaii! Schedule your complimentary Family Hearing Consultation today to learn more about our Oahu, HI, hearing loss rehabilitation program – we look forward to meeting you!